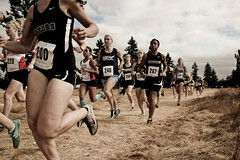 Girls Run Shorter Races than Boys in High School Cross Country: WHY?! It takes a fair bit to get me riled up, but the topic of today’s post frankly makes me mad. My 7th grade son started cross country this fall (that doesn’t make me mad; that is amazing). I love watching him embrace running, competition and the natural camaraderie that flows from it. I can’t wait to watch this season unfold and hopefully many others to follow. But I also noticed something that really, really, really irks me. Boys & girls race different distances. While all 6th and 7th graders race 1.5 mile races, by 8th grade, boys race 2 miles and girls race 1.5 miles. In high school, boys race the 5k, but girls race only 2.5 miles. I tried to rack my brain as to WHY this may be. I am a rational person, so I always try to look to both sides to understand the situation. But I couldn’t find one justification for the disparity. I know several of the female runners in my community. Many I know through coaching my Girls on the Run Program. In fact, I have been incredibly excited because 5 girls from my team last season were able to enter cross country in 6th grade this fall – a full year earlier than normal in my community. I felt like Santa Clause when I told them they could get in. They love to run and to push themselves. They know they can do it. Many have run for years and have several very successful 5k races under their belts. They have run 5ks since they were 8-10 years old. Other girls I know through their families in the community. They are all strong, driven, awesome girls. And all of them can easily cover the same distances as the boys. Sure, everyone knows boys are generally faster than girls, but it seems inherently sexist and unfair to me that girls have to run shorter races. Seriously. If 8 year olds can run a 5k; how can you tell me a 16 year-old cannot?! I did a little research and learned that there are 10 states that still have different race distances for boys and girls (cheers to the 40 that do not!). Unfortunately, my home state of Wisconsin is one of them. According to ESPN, the other states are: Iowa, Kansas, Minnesota, Mississippi, Nebraska, North Dakota, South Dakota, Texas and Oklahoma. Maybe 40 years ago people could justify this disparity with the arguments that girls are just weaker and of course we wouldn’t want local schools to be responsible for young girls’ uteruses falling out, now would we? But this is 2013 and this is simply outrageous to me. Not only is it sexist, but it hurts our female competitors. 2012 Wisconsin State Champ and 2011-2012 high school Gatorade runner of the year Molly Seidel noticed the disadvantage and wrote a letter to the Wisconsin Interscholastic Athletic Association and, in a sassy yet eloquent way, urged them to change their ways. It is hard for Wisconsin cross country runners to race 2.5 miles all season, then switch to 5k for the key races. Unfortunately, the WIAA did not listen. Instead, they argued that girls run shorter distances because schools don’t want to scare off potential participants with longer distances. There comes a time when every state’s sports association needs to let go of the past and move forward. Please don’t take this the wrong way, WIAA, but the 1970s ended more than 30 years ago. It was a great decade — with the BeeGees, disco and lava lamps — but it’s time to toss those bell-bottom jeans … along with certain notions left over from the flower-power days. The idea that female cross country runners should only run a four-kilometer race instead of five kilometers is one of those things. All but 10 states have increased their girls’ races to five kilometers, the same distance the boys run. Yet a handful of states cling to a patronizing tradition that dates back to the days when many people thought that a girl simply couldn’t run as far as a boy could. My entire life I’ve been told that a girl can do anything a guy can do, and the majority of the country’s high school cross country programs agree. We female athletes run hundreds of miles and work hard every day to train our bodies for the cross country season, dedicating just as much effort to our sport as boys do. So why aren’t we allowed to race the same distances? What’s more, by making girls compete at a shorter distance than their peers across the country, Wisconsin is putting us at a significant disadvantage on the national level. We race more than a half-mile less than girls in other states do, and this disparity is visible at regional and national meets. For 17 years prior to the 2010 cross country season, no Wisconsin girl had qualified for the Foot Locker national championships. Some girls feel that since they don’t run the 5K all season, they shouldn’t even try to qualify in the Foot Locker regional race held in our own state. Wisconsin boasts an impressive amount of cross country talent, but no one will ever see it if our female athletes are too afraid to go to bigger races. Like the shag carpeting glued to the floor of our home’s guest bedroom, I realize some things won’t be shed easily. Some girls simply don’t want to switch to the longer racing distance. Some even believe that they’re not fast or strong enough to handle the 5K. This is not only untrue; it’s ridiculous. Cross country is about pushing limits, and our state should be encouraging its female runners to push their own limits, not holding them back with outdated rules and regulations. Wisconsin has become the denim-suit-clad math teacher of cross country programs; everyone knows he is hopelessly outdated — except for him. Yet no one is brave enough to tell him that he needs a makeover. Well, WIAA, I’m telling you that it’s time for an update and imploring you to take action; the girls of our state deserve the opportunity to run the 5K. I’m a senior, so I won’t get to run a high school 5K in my home state — but I hope that some day our female runners will have the chance. So please sell that VW Beetle, shave the sideburns and let your girls compete in the 5K. It’s 2012, and our time has come. First, Molly is my hero. I want running equality for these girls! Give them a chance and you will not be disappointed. Second, hello WIAA (and others)? Don’t your realize that your justification is also unfair? Aren’t you worried about scaring off the boys too, WIAA? Last I looked at my son’s team, there were 10 boys and 40 girls (go girls). If you are worried about scaring people, move them all down to the lower distance (no, I don’t really advocate for this). But make it equal. As Molly Seidel pointed out, running shorter distances disadvantages girls when they enter national championships and collegiate championships where their peers are used to running .6 miles longer. Why would we do this to our up and coming talented runners? Are you as outraged as I am about this? What can we do to make this change? Wow! This is really infuriating for so many reason. What’s really extra annoying about it is that the difference is relativelu insignificant. What girl is going to say, “Oh, I can run 2.5 miles, but 3.1 is just way too far?” Come on! Makes me think whoever makes these rules is completely and utterly unfamiliar with the sport! I know. It makes zero sense. I think the only reason it is still like this is because these programs are too lazy to make the minor adjustments needed to make them equal. It’s total BS. I ran cross country in MO, where both boys and girls run 5k, so I didn’t even know this was a thing until I was in college. I walked onto the Illinois team, and was shocked when the girls from Illinois talked about what a big deal it was to move up to 5k/6k. My parents moved at the same time, and I thought it was so weird to watch my (high school) brother run 5k and then the girls run less. I was surprised to find out that college women run less than college men – I think that’s BS too! Mint, that doesn’t even make sense as an excuse. If anything, making the change would be LESS work because they would only have to mark out one course. When I was in Middle School on our Olympic Day, boys raced 1600m and girls were only allowed to race up to 400. I started a petition and was allowed to run in the boys race. I beat most of the boys (I got 2nd). Since then they have a girls 800 and 1600. Maybe a petition is the way to go. This is really weird to me. When I was in high school in Maryland in the mid-90’s, we (the girls) raced 5k at all of our cross country meets…the same distance as the boys. My teenage girl cousins in Minnesota are now racing 2.5 miles…and I’m confused. If anyone finds a legit explanation for this business, please do share! You know, I never really felt outraged but I’ve known about it for a long time because I ran HS cross country in Minnesota. Now that I think about it, it IS really dumb. Not only does it disadvantage competitive runners when they participate in bigger races, but even for those who are totally noncompetitive and who graduate and don’t run in college but do participate in local 5ks (me! ), it would have been fun to have been able to compare times right away. Basically there is no reason not to do it! I really don’t get it. Just to add another anecdote about how the “scaring people away” argument is ridiculous, my HS team was HUGE and I don’t think participation would have been reduced any by adding a kilometer to our races, considering we routinely ran 5 milers in practice anyway! Yes it is infuriating but honestly the longer distances scared me off when I was in high school. The Junior girls had to run I think 4 kms or 3.5 kms and the senior girls had to do 5k. I couldn’t imagine running 5 kms so I didn’t do cross-country my last year of high school. Now I wish I could go back and make myself run more. I am currently coaching high school running and here the senior girls do 4 kms and the senior boys do 6kms. Last year we only had 4 senior girls come to the city championship. 4 senior girls out of the whole school board (which includes two nearby towns). This year there are at least 20 girls on the list who qualified in gym class to run in the city championships. Now I run long and I enjoy it (marathons, half marathons). My wife is leading the charge to get the distance changed in Kansas, and you might only imagine some of the nasty notes she has gotten from some coaches — who, by the way, happen to be male. In fact, in Kansas, the decision to keep the girls distance down is dominated by males who have done little to no research into the issue and have only hidden behind the worn-out (and invalid) arguments that girls are not as strong and/or they won’t be able to get girls to come out for the sport. Thanks for sending your article to our Facebook page, Let ‘Em Run: Kansas Girls for 5K. Best of luck to your wife – hopefully she is able to talk some sense into your state. Send her on over to Wisconsin next. 🙂 Seriously though, we are very interested in this subject and would love any updates she has during this mission. Those in favor of a 5K should start hosting 5K’s! I can guarantee that there are less then 10 invitations in Wisconsin that host 5K’s for girls. The percentages shows that there should be more races. Once there are more 5K’s then the Coaches association may be in favor of an increase during the Championship phase of the season. I know that there is a push in Minnesota to increase to a 5K but I feel that they will not get anywhere with it since they allow 7th and 8th grade girls to run at the varsity level. Thanks for this data, Dominic! Great insight!